New 2018 Functional Rubber Support Back Cushion Waist Pillow by Generic at Momiji Studios. MPN: DS-RP-001. Hurry! Limited time offer. Offer valid only while supplies last. HOW TO USE 1. Put Dr. Shin on the flat Surface and lay your body down on it. 2. Align your upper hip to the pelvis standing part of the pillow. 3. 1. Put Dr. Shin on the flat Surface and lay your body down on it. 2. Align your upper hip to the pelvis standing part of the pillow. 3. Adjust the posture comfortably. 4. If you feel tension on your lumber, vend knees to relieve fatigues. 5. Stay between 15 to 30 minutes per day. * You can also use it as the lumber cushion on the chair (Recommended to students , drivers and office workers who spend long hours seated). Changing your pillow will change your future! 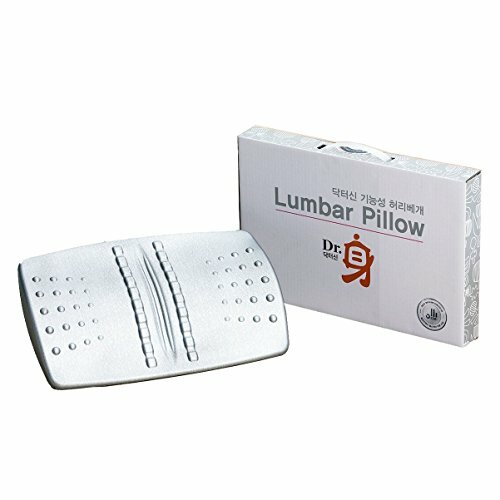 This amazing cervical pillow not only helps for deep sleep but also prevents and cures lumber disc. Dr.Shin naturally induces your cervical layout to the most ideal angle. Easy to use! Just lay down through the lumber lines of the pillow then it interacts with the surrounding muscles by the load weight. Built in bumps provides highly effective lumber and back acupressure massage. Proven Quality Made in Korea With LIFETIME Warranty!